As of now, I have played “Taps” 50 times at various veterans’ memorials and funerals in the Greater Seattle area. 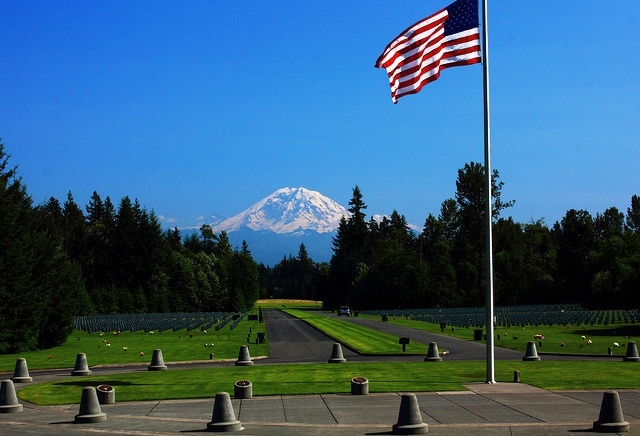 The latest veteran so honored was Richard Louis Larson (1927-2013), whose cremated remains were inurned at Tahoma National Cemetery in Kent on 2 February. 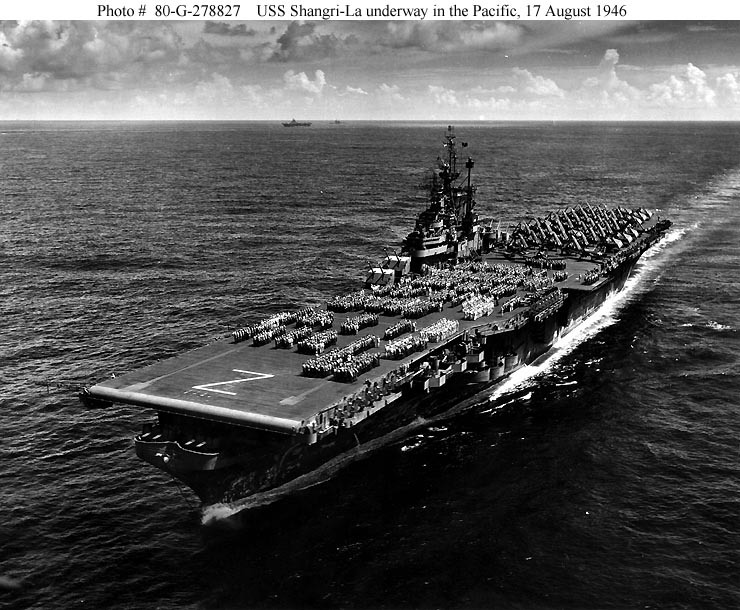 USS Shangri-La (CV-38) underway in the Pacific, crew paraded on flight deck, 17 August 1946, almost exactly one year after V-J Day. U.S. Navy photo. was transformed through an old Navy tradition from a pollywood to a shellback. I later learned from Brian Seguin, a fellow VFW and American Legion member with Richard, that in 1946, he participated in Operations Crossroads, during which atomic bombs were tested at the Bikini Atoll in the Marshall Islands. In September 2011, Brian escorted Richard on his Honor Flight to Washington, D.C. (see www.honorflight.org). That’s when Brian learned that Richard carried a small Bible, given to him by his parents when he entered the Navy at age ~17. Richard also was a talented poet and musician. He played cornet, trombone, baritone, and drums in Salvation Army bands. For 35 years, his father had been a chaplain for the Salvation Army men’s service department for alcoholics, helping men rebuild their lives. Richard met Lillian at a Salvation Army camp, and they were married 62 years. Richard often volunteered for the Salvation Army’s Emergency Canteens. And he loved to attend Salvation Army band concerts (see my blog post of 3 June 2012). He had many more laudable qualities and accomplishments than I have mentioned here—he was special, a man of deep Christian faith and practice, a servant of others. It is blessing to me to sound “Taps” for such men. Please click on either photo to enlarge it. This entry was posted on February 5, 2013 at 1:42 pm	and is filed under Ceremonies & Celebrations. Tagged: American Legion, band, bugler, concerts, cornet, Navy, Salvation Army, Shangri-La, Tahoma National Cemetery, Taps, veterans, VFW. You can follow any responses to this entry through the RSS 2.0 feed. You can leave a response, or trackback from your own site.